Four apartment units are transformed into one modern loft oozing with glamour and drama. The main-floor living area of the loft was kept open yet sectioned off into living zones including the kitchen, dining area, living room and bar. Identical sectionals covered in an eggplant crushed velvet allow for ample seating in the living room while still allowing guests to move about the space comfortably. The bar was fitted with a natural cut-wood top to set it apart from the main kitchen. The custom-built wine cabinet separates the living areas from the private spaces in the loft. The master suite is the epitome of high drama with plush texutres and deep, rich color. Floating, mirrored vanities amp up the glam factor in the master bath. The master shower was built into an old elevator shaft. 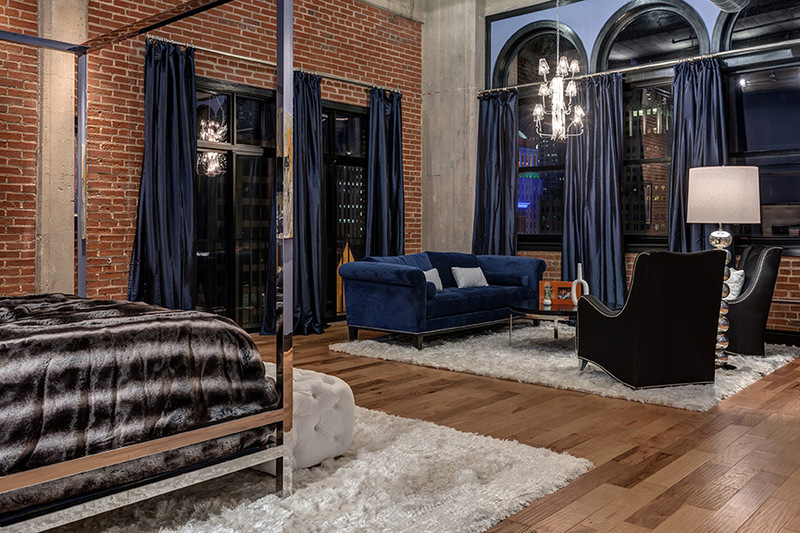 Loft living offers urban dwellers high ceilings, wide-open spaces and industrial charm with the amenities of the city at their doorstep, so it is no wonder that a St. Louis family of four was fond of the loft life. What they weren’t so fond of…having their home spread out over three separate levels. When an opportunity came available to purchase four adjacent apartment units on one level as well as the rooftop, the homeowners jumped at the chance to shrink their main-floor living space from three levels to one. Condensing their space didn’t mean giving up square footage or style. With spectacular views of the city from their newly renovated eight floor unit, the family relied on the creative mother-daughter design team Shirley Strom and Katie Marvin of S&K Interiors to transform the space into a modern design full of high-drama glamour. “We were fortunate in that we were brought into the project at the very beginning,” says Marvin. The homeowners also gave them a lot of creative freedom in their design decisions. 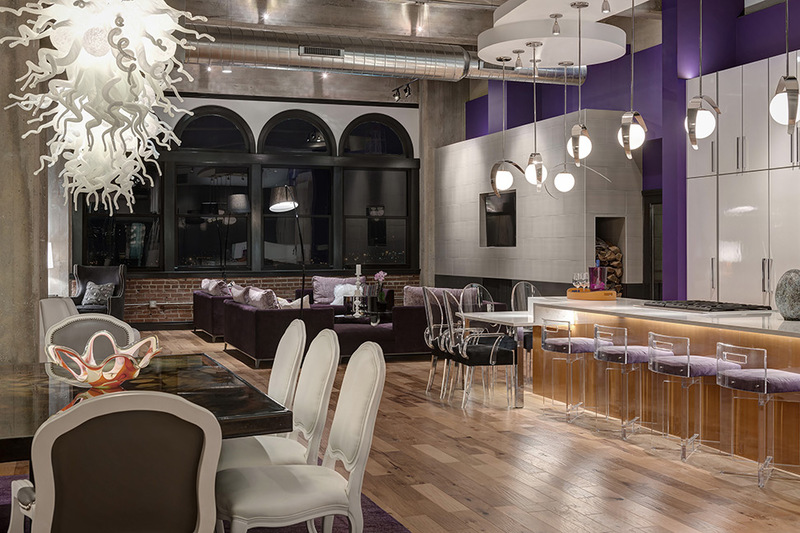 The only true specifications they were given were to incorporate shades of purple – the wife's favorite color – while keeping the design modern yet comfortable for a family. Before Shirley and Katie could start working their magic, the four existing apartments had to be demoed and the space reconfigured to the layout the homeowners desired. The two northern units were opened up to the main-floor living spaces, while the two southern units became the private areas of the home. M2 Architecture Studio and McGowan Brothers Development served as architect and contractor. As you step off the elevator into the secured foyer, you are surrounded by soft-purple walls faux painted by Claude Breckwoldt, which were inspired by a wallpaper the designers found. The painting immediately makes a high impact and sets the tone for the rest of the home, which you enter through a set of French doors. Open yet sectioned off into living zones, the main floor includes a kitchen, dining area, living room and bar. “The homeowners do a lot of entertaining, so they wanted to be sure their living space could accommodate large crowds yet still feel intimate in any setting,” says Strom. 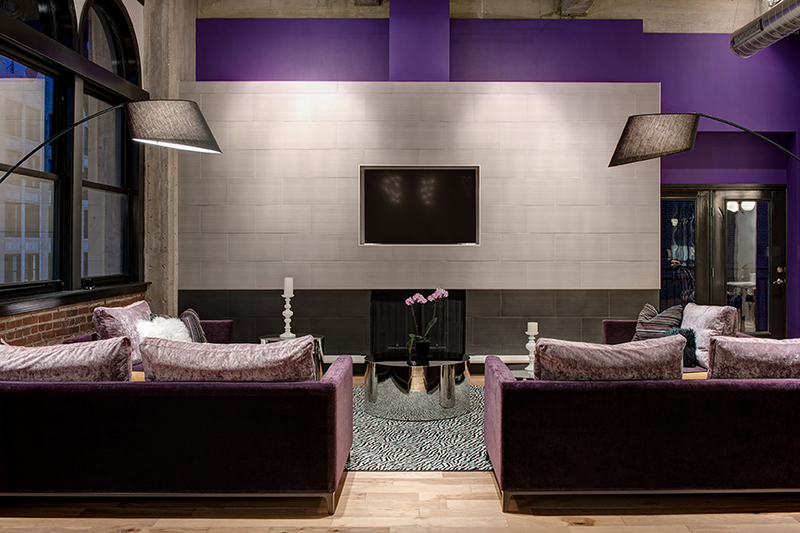 The living room’s showpiece is two identical sectionals covered in an eggplant crushed velvet. The designers knew they needed to have ample seating in the space, but that it had to be able to function for guests to move about. Separating the sectionals creates a natural walkway for anyone coming in or out of the space. The fireplace wall was built up and out with porcelain tiles in white and gray. “We used lots of textures and fabrics throughout the home to keep the space feeling comfortable,” Strom explains. A prime example is the juxtaposing of the fabric on the sofas with the stainless-steel drum tables and sleek tiles on the fireplace. Situated behind the living room is a cool bar area. A must-have of the husband’s, the bar not only had to look good but be functional. The designers did not want it to feel like it was another kitchen given its close proximity in the open space, so they gave the bar a natural cut-wood top to set it apart. 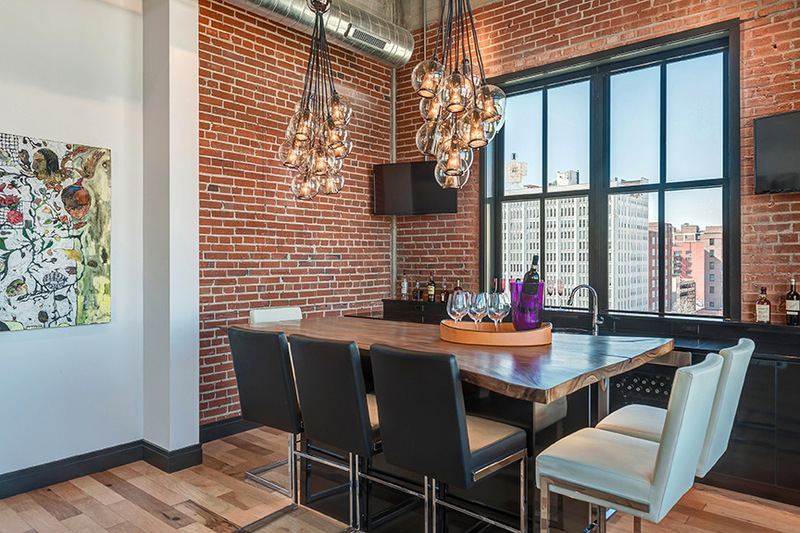 Two cluster lights bring a modern, industrial vibe to the space, while the exposed brick plays up the loft feel. A window was added to the space to bring in even more natural light. The space is perfect for entertaining groups large or small. On the opposite side of the room is the kitchen and dining area. Floor-to-ceiling modern, European frameless cabinetry by Beck/Allen Cabinetry adds height and drama to the space, complementing the expansive ceilings. The wife loves to cook, so she has plenty of storage space in the cabinetry walls. The designers went for a two-tone approach with a wall of dark-gray cabinets contrasting against the white cabinet wall. Because the homeowners frequently entertain, all of the kitchen appliances were placed on the interior of the island to hide them from view in the more formal entertaining areas. The figured Anigre island finished in a glossed cognac brings a fun pop of color to the space while contrasting with the purple accent wall. A custom-built soffit houses a row of seven stainless pendant lights, which can be turned into various positions. The homeowners wanted to have high and low seating options for both formal and informal dining, so Shirley and Katie created a two-tiered center island to accommodate from four to eight. Additional seating is also available at the custom dining table by John Beck Steel just beyond the kitchen. Two white Chihuly-inspired fixtures hanging above the table amp up the style. 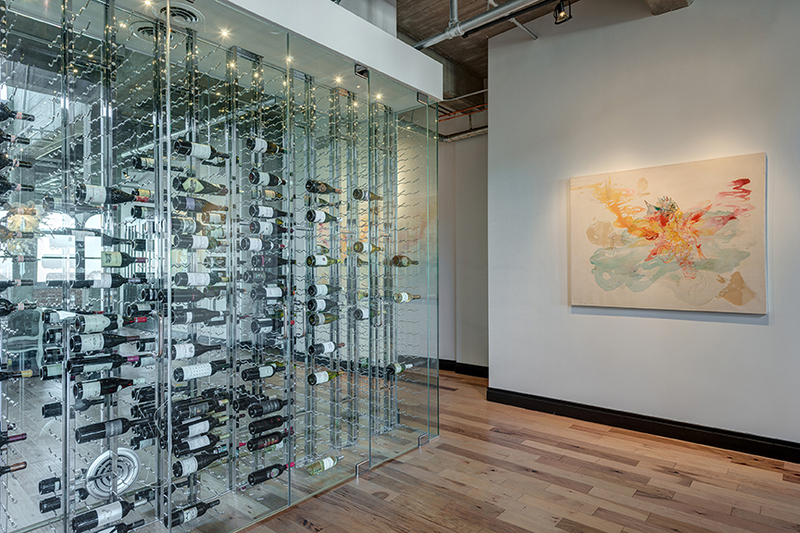 A mirrored-glass wine storage cabinet separates the living areas from the private spaces in the home. The homeowners originally wanted a freestanding glass wine room, but the logistics just would not work out so Shirley and Katie designed a custom, built-in wine cabinet. Built into an existing closet, the cabinet holds up to 400 bottles with designated refrigerated zones. By mirroring the cabinet walls, natural light from across the room is carried into the space. Moving beyond the wine wall, you enter the private area of the residence, which includes an office, the children’s bedrooms, a living room, theater room and master suite. Inspired by a photo of one of Elton John’s bedrooms, the master suite had to be high drama. A stainless-steel canopy bed is outfitted in plush fabrics to keep the space comfortable. Opposite the bed is a cozy seating area featuring a midnight-blue velvet sofa and a pair of wingback chairs. 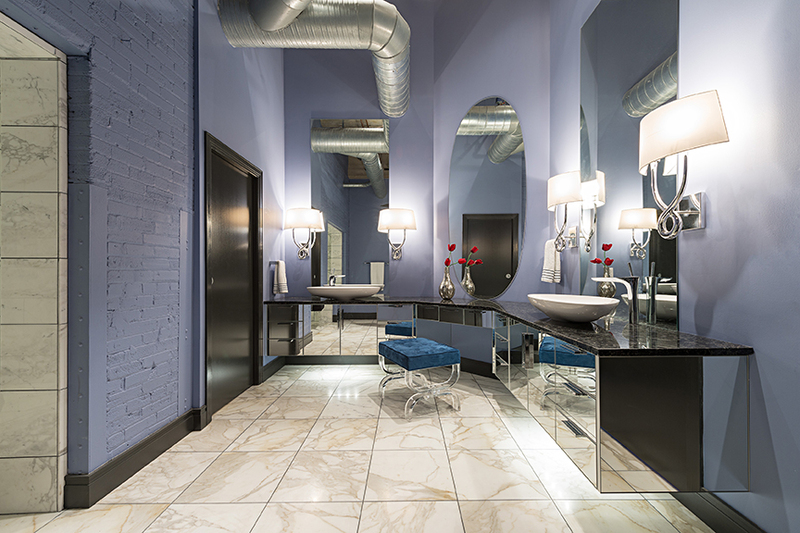 The deep-blue theme makes a powerful statement against the soft fabrics and exposed brick wall. “We wanted to keep the industrial feel, and our clients liked exposed brick,” Marvin explains. The master bath is even more spectacular than the bedroom. 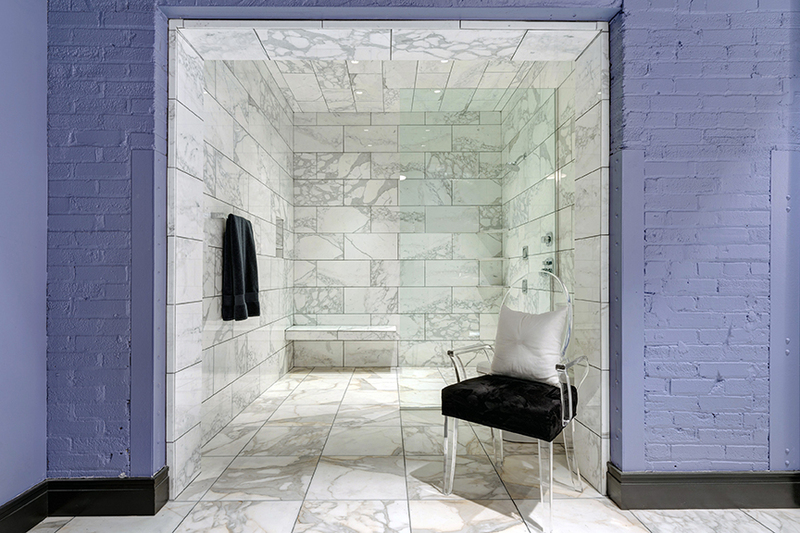 Built into an old elevator shaft, the shower is oversized with floor-to-ceiling marble tiles that extend out into the rest of the bath. Shirley and Katie painted the brick wall a soft blue so the marble could shine. Floating mirrored vanities keep the glam going. The second level of the loft includes a guest suite, guest bathroom and full-sized kitchen for overnight guests. Perhaps one of the best features in the loft is the expansive rooftop deck complete with a pool, hot tub and grilling area, all with stunning views of downtown. Whether entertaining with a large group or spending a quiet evening alone, the homeowners are cozy in their newly glammed loft. Bold fixtures, daring splashes of color and most importantly trust in their designers paved the way for a modern home that speaks to their personalities while making a statement. “Shirley and Katie took our pictures from Houzz and magazines and converted our raw space into our dream home,” the homeowner says proudly.